My daughter loves cupcakes, so I try to make them on occasion as a sweet surprise. Her face completely lights up when she sees them—because, let’s be honest, she really loves frosting. 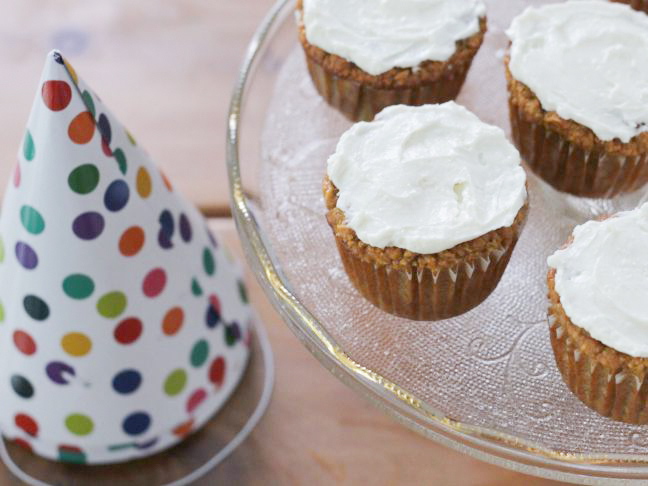 So if your kiddo has a birthday coming up or you just want to make a treat to share, these sweet potato cupcakes are a great option. We tend to make less-sweet cupcakes that can double as a snack, so these are packed with wholesome ingredients and yummy flavor. 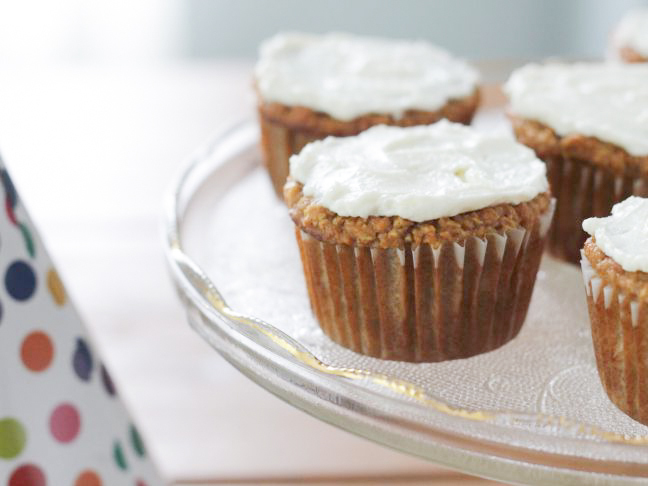 They taste more like carrot cake than like the plain cupcakes you could get in the supermarket bakery aisle, but they are a pretty delicious way to eat some vegetables. Bright orange sweet potatoes are rich in vitamin A, and they have a sweet flavor that tastes really good in baked goods. When grated and baked into a cupcake, they almost dissolve, so they are less noticeable than carrots are in carrot cake. On the day I made these, I served one to my daughter with her dinner, and she happily alternated between her sweet corn, burger, and the cupcake. The edges become almost caramelized in the oven, so they are ever so slightly crunchy, and the cream cheese frosting adds a just-sweet-enough topping. 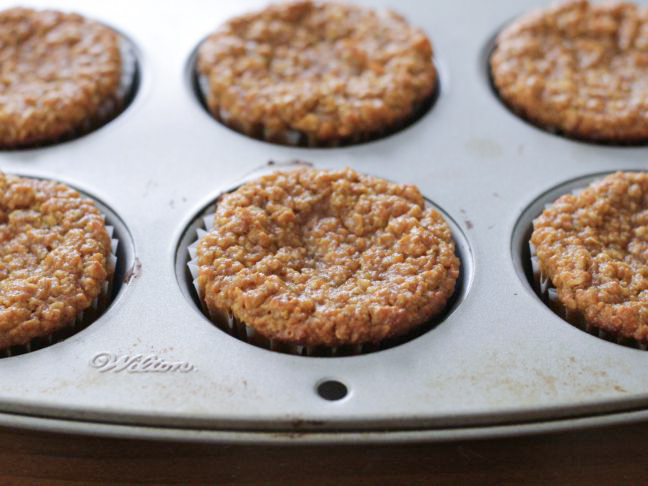 Like many of my baked goods, I made these with a base of ground oats. I can’t tolerate gluten, so gluten-free oats have become my go-to wheat flour substitute. They do require a bit more egg to make up for the lack of structure that gluten provides, but I love using a whole grain pantry staple this way since it’s an easy way to ensure that my whole family gets to enjoy my treats. And, since we often prefer having a small batch of cupcakes, this recipe makes six large ones. The measurements are easy to double, though, so if you are looking to make a whole dozen, simply multiply everything by two and fill twelve muffin cups. The flavor of these delicate cupcakes is best chilled—and paired with a cup (or sippy cup) or milk or an adult mug of coffee—so you can make them ahead of time and store them in the fridge until dessert. Simply frost them right before serving and enjoy! Step 1: Preheat the oven to 350 degrees F, and line 6 cups of a muffin tin with paper cupcake liners. Step 2: Place the oats into the bowl of a food processor and grind into a coarse flour for about 30 seconds. Add the rest of the ingredients except for the cream cheese, including ¼ cup of the honey and 2 teaspoons of vanilla. Process to combine, stopping to scrape down the sides of the bowl as needed. Spoon batter into muffin cups about ¾ full. Bake for 34 to 36 minutes, or until the centers are firm to the touch and a cake tester inserted into the center comes out clean. Let cool completely in the pan. Store in the fridge for up to three days. Step 3: To make the cream cheese frosting, blend together the cream cheese, 1 teaspoon of vanilla, and 2 tablespoons of honey. Spread onto cupcakes and serve immediately.